Enzymes that regulate addition and removal of palmitate may serve an important role in regulating protein sorting and clustering at the synapse. However, the diversity of proteins modified by palmitate combined with the lack of a common consensus sequence for palmitoylation hindered the identification of enzymes involved in this process30. Characterization of the first enzymes involved in palmitoylation came from work done in flies which revealed that skinny hedgehog (Ski) and porcupine (porc) are palmitoyl acyl-transferases (PATs) that mediate palmitoylation of secreted factors hedgehog and Wnt-1. This lipid modification is critical for hedgehog and Wnt-1 function in neuronal differentiation31-33. 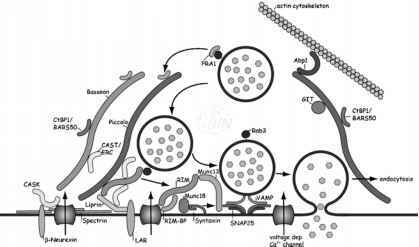 However, Ski and Porc are luminal proteins that palmitoylate substrates within the lumen of the secretory pathway, and thus are not likely involved in palmitoylation of cytosolic proteins. A major advance in the field came from genetic analysis of a family of yeast enzymes that contains a cysteine-rich domain (CRD). This domain also harbors a conserved DHHC (Asp-His-His-Cys) motif. These include Erf2p/Erf4p protein complex which palmitoylates Ras34 and Akrlp which modifies the yeast enzyme casein kinase II35. The existence of 23 mammalian proteins that contain the DHHC domain prompted investigations to analyze the role of these proteins in neuronal protein palmitoylation. Investigation by Bredt and colleagues characterized the role of the existing 23 PATs named DHHC-1 through -23 in the palmitoylation of a subset of neuronal proteins22. Among them, DHHC-2, -3, -7, and -15 showed the strongest specificity for PSD-95. In a parallel work, in vitro palmitoylation assays revealed that the huntingtin-interacting protein 14 (HIP14)36, also known as DHHC-17, palmitoylates numerous neuronal proteins which include huntingtin, PSD-95, SNAP-25, synaptotagmin I, and GAD6537. The identified enzymes utilize the intermediate palmitoyl-acyl CoA for palmitate transfer to specific substrates. These studies also revealed that activity of the purified enzymes does not rely on auxiliary subunits. Overexpression experiments as well as loss of function analyses in neuronal cells demonstrated that most of the identified DHHC proteins modulate palmitoylation-dependent protein trafficking22. For instance, knockdown of HIP14 reduces synaptic clustering of PSD-95 and GAD65 37. Although the exact subcellular locations for palmitoylation remain ambiguous, the enrichment of several of the identified DHHC proteins in the Golgi suggests that this compartment is a major site for palmitoylation37-39. Studies on HIP 14, however, revealed that this enzyme also associates with tubulovesicular organelles and recycling endosomes present in dendrites, axons, and spine necks37. Mobile HIP14-positive vesicular structures were rapidly transported from a perinuclear compartment to various subcellular locations. Thus, at least some of the identified enzymes are involved in the cytosolic modification of both cytoplasmic and integral membrane proteins at numerous subcellular locations. In the future it will be important to determine whether the efficacy of these enzymes is subject to changes in neuronal activity and whether other binding partners regulate their function. The availability of new advanced imaging techniques and sensitive assays for detecting palmitoylated proteins may help clarify mechanisms that regulate the rate of turnover of palmitate. These tools may elucidate some of the mechanisms that control protein clustering at the synapse.